The Body Shop is one of those internationally well known cruelty free brands that has quality product for affordable price. What i really liked about the brand other then shower products and scents, are how the company works to prevent testing on animals as well as striving to be more sustainable and natural as possible. I went to visit a store whilst in Indonesia to get my mom some body soap, and saw a lot of products within the “Spa of the World” line. The sales lady told me that this “Firming Ritual” part of that line was the latest in Indonesia, and as i like me some spa experience that won’t break my bank or when last minute fix before a wedding that got me on hook to try the scrub out. The scrub is said to be formulated with grape seed powder from France and Community Trade sugar from Paraguay, which makes the scrub less harsh on the body as there are powder that are mixed in with oils. Glycerin, Sucrose, Propylene Glycol, Isopropyl Palmitate, Parfum/Fragrance, Polyacrylamide, Bertholletia Excelsa Seed Oil, Phenoxyethanol, Aqua/Water/Eau, C13-14 Isoparaffin, Vitis Vinifera Seed Oil/Vitis Vinifera (Grape) Seed Oil, Caprylic/Capric Triglyceride, Oenothera Biennis Seed/Oenothera Biennis (Evening Primrose) Seed, Laureth-7, Geraniol, Vitis Vinifera Seed Powder/Vitis Vinifera (Grape) Seed Powder, Limonene, Vitis Vinifera Bud Extract/Vitis Vinifera (Grape) Bud Extract, CI 77891/Titanium Dioxide, CI 19140/Yellow 5 Lake, CI 77288/Chromium Oxide Greens. Based on the ingredients list, sugar still plays a huge role therefor you still can feel the scrub on your body although less harsh. 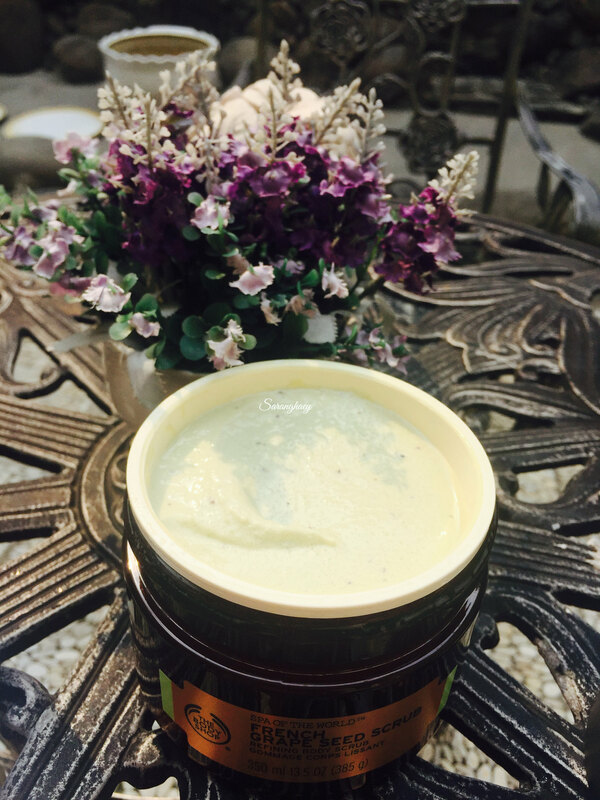 The oils mixed in helps soften and moisturises the skin. Apply it on arms, tummy, tights and bum area, with a circular motion technique twice a week. The sales person persuaded me to try this specific product out before getting other products from the collection or recommended use, and I did not regret one bit of this product. As i have caught the flu bug these past few of days, all i wanted to do was to treat myself to a spa retreat. As much as i wanted to go for spas and saunas, my body just did not allow me to be outside for more then an hour before feeling feverish. Therefor i could only stay home and have hot showers to help ease stuffy nose. It was the perfect opportunity for me to start cracking the scrub more often. The sugar particles were small and fine, therefor made easy to scrub onto the body. Being under the air-conditioning very often, my skin got quite dry skin. And with the hot humid weather, i haven’t found the best body lotions that suits my skin. 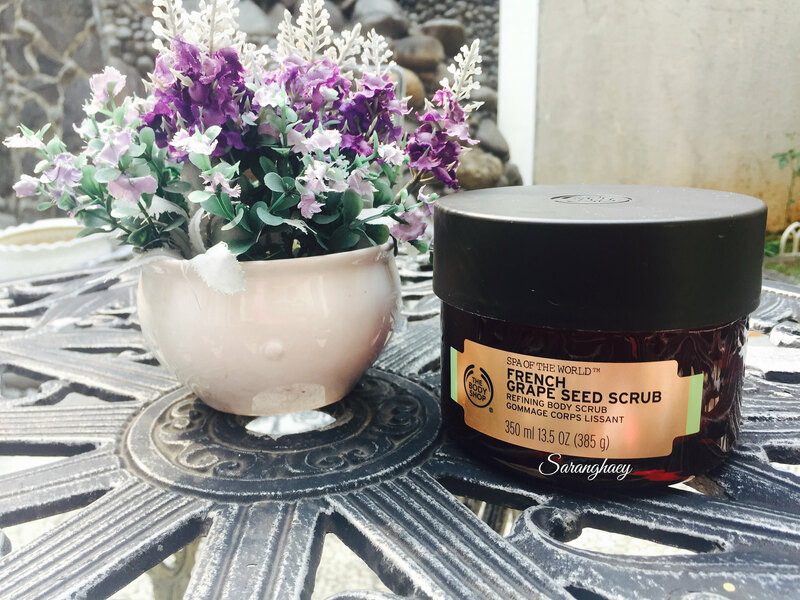 After the use of The Body Shop’s French Grape Seed Scrub, it helps moisturise after getting rid of rough, dead skin. The last time i tried out a scrub by The Bodyshop, it was a good 4 years ago which you can read here: Chocomania Sugar Body Scrub – The Body Shop. I didn’t like them as much since the sugar particles were a lot larger then the current ones, and not as moisturising. Overall, The Body Shop Spa of the World™ French Grape Seed Scrub provided me with an enjoyable DIY spa session at home. It made showering in hot water less painful and drying after, as it brings moisture back to the body. It would probably last me for a good 6 months before running out, but I’m up for getting the recommended accompanying products.